What makes this solar light for hanging signs unique is that it clamps onto your double sided sign and illuminates both sides. Ideal for real estate signs, commercial signs, and address signs. For use with two sided signs up to 24" x 36" and up to 1/2" thick. Andoized aluminum arms and clamp. Clamp fits over and attaches onto signs up to 1/2" thick with anti-theft screws. Lights for 8-10 hours once fully charged. Charging time is 7-8 hours. 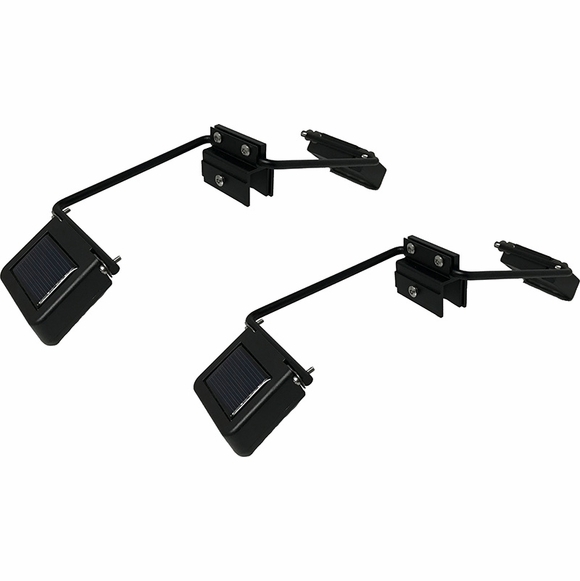 Each set includes two units consisting of arms, clamp, and lights. Use both units for larger signs or use one unit for smaller signs.